They found that human brains trade off ‘robustness’ — a measure of how synchronized neuron signals are — for greater efficiency in information processing. The researchers hypothesize that the results might help to explain humans’ unique intelligence, as well as their susceptibility to psychiatric disorders. The findings were published in Cell1 on 17 January. Scientists say that this type of unusual study could help them to better translate research in animal models of psychiatric diseases into the clinic. The research exploited a rare set of data on the activity of single neurons collected deep in the brains of people with epilepsy who were undergoing neurosurgery to identify the origin of their condition. The technique is so difficult that only a handful of clinics around the world can participate in this type of research. The study also used similar, existing data from three monkeys and collected neuron information from two more. Over the decades, neuroscientists have discovered many subtle and significant differences in the anatomy — the hardware — of the brains of humans and other primates. But the latest study looked instead at differences in brain signals. The study was a collaboration between Rony Paz from the Weizmann Institute of Science in Rehovot, Israel, who studies the dynamics of neural circuitry involved in learning in macaques, and neurosurgeon Itzhak Fried of the University of California, Los Angeles. Paz’s research focuses on two very different brain areas. One is the amygdala, an evolutionarily primitive area that underlies basic survival skills, such as running away from an advancing tiger. The other is the more evolved cingulate cortex, which processes more sophisticated cognitive behaviours such as learning. Paz wanted to find out how neurons in these regions in monkeys might differ from their equivalents in humans. He turned to Fried, who pioneered the use of single-neuron recording techniques in people with epilepsy who do not respond to drug treatment. 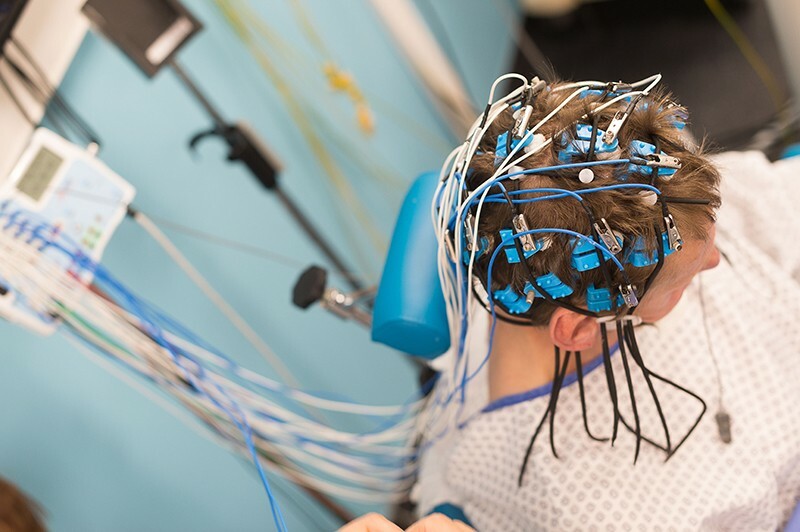 These patients can undergo a treatment that involves implanting a series of fine electrodes in their brains to record electrical activity, and thereby pinpoint the origin of their seizures. The patients remain in hospital until a seizure occurs; they then undergo an operation to remove the electrodes and the damaged brain tissue that is the source of the epileptic activity. While waiting for seizures to occur, patients often participate in simple experiments that explore brain function. Paz and Fried identified single-neuron data from the amygdala and cingulate cortex in a large data set collected from people who happened to have had electrodes implanted close to these brain areas as part of their treatment, and had participated in a memory study2. They compared two properties of the activity these neurons with those of Paz’s monkeys: robustness and efficiency. The data were collected from nearly 750 neurons from the two brain regions from the five monkeys and seven humans. They comprise a long series of firing spikes or silences from single neurons recorded over several hours. The researchers searched the data for the twp properties: they defined robustness as the level of synchrony, or near synchrony, in both the firing of neurons and the frequent repetition of similar patterns of spikes, and efficiency as having more combinations of patterns in the activity. They found that in both species, the signals in the amygdala were more robust than those in the cingulate cortex. But those in the cingulate cortex were more efficient. Both regions in humans were less robust and more efficient than those in monkeys — so humans have sacrificed some robustness for increased efficiency. It makes sense, says Paz. The more robust a signal, the less ambiguous or error-prone it is. “If I see a tiger, I want all of my amygdala neurons to shout, ‘Run away fast!’” But in higher species, such as primates, the brain evolved more flexible areas — the cortex — to allow for more considered responses to the animals’ environments, says Paz. Humans took the trade-off further than other primates. Their smarter, but more error-prone, cortices might explain their vulnerability to psychiatric disorders, he Paz. That resonates with other theories in neuropsychology, which propose that synchronization of neuronal activity in the brain might be correlated with psychosis or depression, says cognitive neuroscientist Robert Knight at the University of California, Berkeley. “This line of research is very important, because most neuroscience studies are carried out in animals with the assumption that the core pattern of neuronal activity holds across species — for humans, too,” he says. The researchers’ robustness–efficiency trade-off hypothesis is an important one that needs to be explored in further studies, says neuroscientist Christopher Petkov of Newcastle University, UK. Direct comparisons between monkey and human data sets are challenging because it is hard to know whether the two species were in comparable states of mind when the data were collected, he notes. But such comparisons are “immensely valuable”. Paz says that the long recording times in his current study probably ironed out any differences in mind states, but that he is planning new studies that will collect data from neurons while monkeys and humans carry out similar tasks that could track a particular state of mind, such as anxiousness. It is challenging to organize studies on human brains because of the small number of people globally who are eligible to participate. In people with epilepsy, surgeons place the electrodes only in brain ares close to where they believe seizures to originate and these areas might not be interesting for research questions. Fried says that each year, only 10–15 patients in his clinic take part in studies. Most eligible patients are keen to be involved because “waiting in the hospital is boring, and they are interested to learn more about their own brains”, Fried notes.